Splatoon is a third-person shooter with an interesting twist. The players shoot ink at opponents and surfaces. Players can "swim" through their own ink color on surfaces. The goal for multiplayer is to cover the area with team's color as much as possible; for single player, the player infiltrates an enemy octopus army that uses its own arsenal of ink weapons. Splatoon is now released. Here are some videos of Splatoon trailers/gameplays. Bump... Any interest? I just played the Splatoon Testfire demo, and it was so fun! Have anyone played the demo as well? I'm not the biggest fan of shooter games nor do I have a Wii U, but it sounds pretty interesting. EDIT: Should've watched some of the gameplay first before typing this. It actually looks like A LOT of fun. The squids are adorable. OH MY GOSH I have been watching Splatoon gameplay for, like, hours! I need that game! about Splat Roller if anyone is curious. I'm excited for it as well! I played on every Splatoon Global Testfire's time schedules (even woke up on 6:30am for it), and watched two 1-hour Splatoon Testfire videos. I remember seeing the reveal during E3 and thought it looked pretty awesome. If I had money, I'd buy it when it comes out. Alas, I am a poor, unemployed student. Isn't it coming out on the 29th? I just wish there were more tentacle styles or something, because the only thing separating your character before you can buy gear is skin tone and eye color. 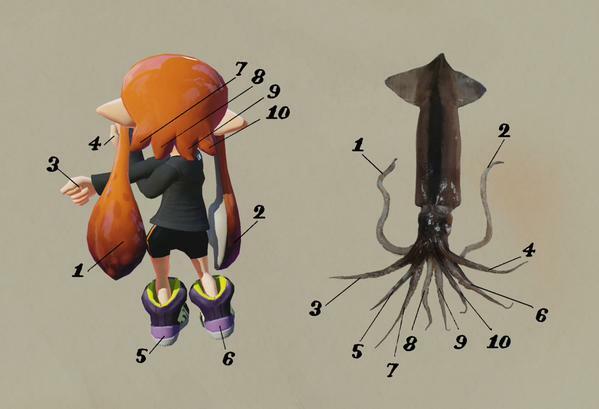 Would be nice to have different 'hair' options yes, but I think the developers want to have the tentacle numbers to match the real squid's tentacles, as shown below. It probably would be difficult to try make new 'hair' style for Inklings, but who knows, maybe the developers will add more styles in the future. 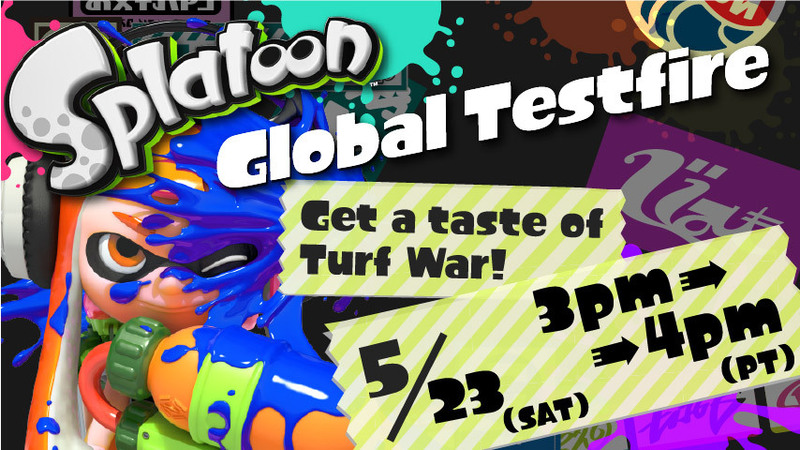 Splatoon just confirmed one more round of Global Testfire Demo, which will be on May 23 from 3 to 4pm PT. I sort of expected this. It's starting in a few minutes. My screen name is Konzpiraky, maybe I'll see some of you there. Edit: I wasn't able to connect for over 40 minutes so I just gave up. Oh well, just 6 more days until Splatoon comes out. They should just rename it squid jump, because that's pretty much what I was doing for 57 minutes of the testfire. I wish I'd heard about the game when the first three were going on. EDIT: They extended the testfire to two hours. It wasn't a disappointment after all. Ahh, I never knew the testfire was extended to two hours. I thought the connectivity issue was my own fault so I just left and turned Wii U off. Bummer. At least Splatoon is coming out this week. I pre-ordered the Splatoon amiibo package, hopefully it will be ready for pick up on Friday. My brother and I are just going to pre-download it the day before it comes out. Why isn't this thread getting enough attention T^T It's an amazing game. Splatfest will take place on June 20th, ending on June 21th. here (don't worry, it's actually a good trailer unlike 'kid squid' one). I know. T^T I don't even own the game, nor the console it's on, but I think it's just so awesome. It's very addicting to watch, too. And the soundtrack is just... please help. I'm addicted. This thread needs more attention. Also, I need to steal those GIF's in your signature. They're so entertaining to watch. I'll give this thread some gosh darn attention, I got into it 5 days and all I do is eat, sleep and breathe Splatoon, oh my LORD. I don't have it myself but my friend has kindly welcomed me into her home just to waste my life shooting paint in people's faces. I may already have a silly splatoon hat with tentacles in the works... Issues of being a cosplayer. Splatoon hat? I'd like to see it when it's finished. I use Aerospray RG. I love trolling people by placing ink mines around choke points, or when I'm about to get splatted. Inkstrike is very useful for plenty of reasons, such as quick points and Ranked Battle. So yeah, people say it's overpowered. Ahhh, most definitely! It's a lot of wasted fabric right now... I keep completely overshooting how big/small I make those tentacles. Might have to buy a few hats and inspect the magical prowess of other people more talented than I.
I hear there's a new map coming up soon, which is nice... feel like I've already bled all the current maps dry. Right now I'm googling some nice cheap Wii U's because my obsession with owning it for myself is borderlining psychotic. Also the gifs in your siggie are amazing. 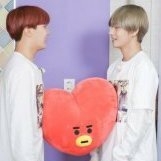 I keep seeing you around the forum and just pausing to watch them. Oh my, I hope you'll get the tentacles right next time. Wasted fabrics are definitely no fun. Yup, Bluefin Depot! Not my best stage though. Darn 'em rollers and snipers. I recommend checking out local game stores for cheap used Wii U, if available. I fell in love with the animations when I first saw the Japanese Splatfest trailer. That is why they're in my signature. I accidentally won an Ebay bid on a really cheap Wii U. £99. HHHHHHHH. So good news is I can stop mooching off my friend! I'll be buying Splatoon tomorrow and then for the next few weeks, my family will never see me again.